Travelling with kids in tow could be really taxing and stressful at times, for some, if not for all, parents. I remember posting a photo in my Instagram account showing how messy our room was while I was packing the clothes and all the other items we need to bring with us to our vacation in Boracay. Now, what will lessen your anxiety is making sure you include in your packing list all the travel must-haves when vacationing with kids. Bringing the essentials should not mean you should bring your whole house with you. Remember you should also pack light to avoid paying extra for excess baggage. To help you with that, I've compiled my packing list must-haves. I actually have written a post in the past about what to pack when swimming with kids, but this new list will include more items which you will need when spending several nights away from home. 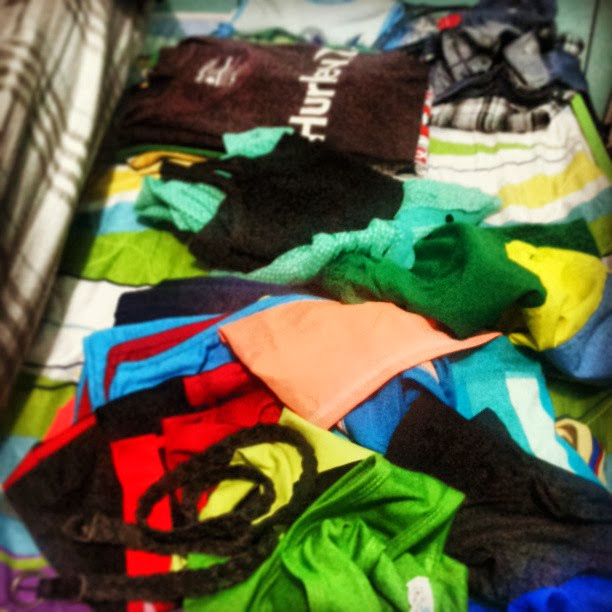 Dry and Wet Clothes - This accounts for swimwear, clothes for going out, clothes for changing and clothes for going home. Plan your daily outfit if you can so you don't need to bring extra baggage. But bringing a toddler with you spells the difference. A toddler requires more clothes for changing for possible wetting of his pants/shorts. His outfit changes should be planned as well. TIP#1: Bring powder detergent for emergency staining and should you fall short on clothes you brought for the trip or for extended days. Bring a shawl or jacket for unexpected cold nights/weather. Bring lightweight clothes to avoid heavy baggage. Toiletries - Bath, after-bath and total hygiene toiletries shouldn't be left behind. But make sure you bring sachets (for shampoos or toothpastes) or fill smaller containers/automizers instead of bringing the big bottles for your lotions or colognes. As much as possible put all the toiletries in one hanging kit. Bring Zip Lock bags- It's where I put used soap/wet containers when packing back home. Milk/Bottles/Diapers - If you breastfeed, pack your breast pump with you and the milk bottles. If you don't, bring the milk in boxes or cans then emptied bottles. Since I still have a toddler and to make the travel and sleeping time convenient and fuss-free I bring diapers with me. Don't fill all the packed milk bottles with water. Just fill enough bottles for in-flight/day demand then fill the rest of the bottles when you reach your hotel. Better bring your handy milk container for whole day pasyalan. Bring bottle cleaner brush and solution as well. Inflatables/Beach Toys/Book - To keep the children entertained especially when there are waiting times (boarding the plane, dining at a restaurant, etc) bringing a couple or more pieces of toys in your handbag magically prevents tantrums or crankiness of your toddler. Inflatables are important (especially the vests) for your toddler's safety when swimming in the pool. Sand toys are also important to bring when going to the beach to encourage our children's creativity and motor skills. Like what my Wessie kept on saying when we were playing by the shore, "It's so much fun Mommy! It's so much fun Daddy! It's so much fun Kuya Dandre!" Safety Tip: Never ever leave children in the pool by themselves to avoid untoward events. Wash the sand toys immediately after use to avoid bringing the sand with you in the hotel. Vitamins/Important Medicines - Not because we're vacationing, our wellness should also take a break. Bring the vitamins or medicines with you! If in capsules or tablets, put them in a pill box or zip-lock bags. If in syrup, bring the bottle with you but make sure you pack them neatly/tightly and in a protective case or wrap some clothes around it to avoid spillage and bottle breakage. Sunblock Lotion for the face and body - I know there's nothing more fun than swimming in the beach or in the pool but going out there (the whole day pa!) without sun protection is a huge no-no! We know how harmful the rays of the sun could be to our skin. So make sure it's in your carry-all bag the whole day and apply on all parts of the body generously. SUNBLOCK TIPS: You usually read SPF 30 or 50. What does that mean? Add Zero to the number and that's how many minutes you are protected. For example, SPF 30 means 300 minutes of sun protection. Liquid/Spray Sunblocks is better for the face. While we use Sunblock lotion for the body. Insect Repellent - My kids never go out without insect repellent. Prevention is still better than cure. You'll never know what these mosquitoes/other insects bring right. Apply on yourself too to avoid scary Dengue or Malaria. First Aid Kit - I bring a small bottle of the following: alcohol, Agua Oxigenada, Providone Iodine for accidental cuts or wounds. I also bring cotton and band-aids as well. Extra Shopping/Eco-bags - In my carry-all handbag, I bring a piece or two foldable and re-usable eco-bags for those unexpected pasalubong shopping trips. Foldable fans - You'll never know when it could get too hot, so always bring a fan with you to keep the children and your hubby/partner cool. Umbrellas - Some find bringing umbrellas a hassle. For me, it never will be a hassle especially if it will mean protection against the rain and even from the scorching heat of the sun. When we were in Boracay, we experienced unexpected rainy nights. We were out for dinner that time, good thing, I brought umbrellas with me and we didn't get stuck in one place waiting for the rain to stop unlike others. Zip lock bags - When out for swimming and you can't help bring your phones and other gadgets with you, protect them by putting them in zip lock bags! It's not practical to buy those fancy water resistant pouches sold on the streets, they are over-priced. Gadgets/chargers - Mobile phones are already a necessity for faster communication. So don't forget to bring them and their chargers too. If it's a must for you to bring other gadgets such as tablets or other game consoles, then pack it with you and their chargers. Safekeeping Tip: When in the hotel room, make use of safety deposit boxes (make sure you change the pin) to keep these gadgets when leaving them in your room. We've heard a lot of horror stories about missing valuables in hotel rooms. Cookies for Kids and Gum for You - Kids could get bored waiting and could get hungry too! Pack cookies or their favorite snacks to nibble on anytime inside your carry-all bag. Don't forget to also bring a gum for yourself and other adults. Sometimes we're out all day, so pop a gum in your mouth after meals for that instant freshness of the breath. Also, gums help in comforting stuffed ears during plane's take-off. Documents (plane tickets, IDs a notebook) - As a mom, our role is to be the organizer, the keeper, the go-to-person when things are needed. So documents such as plane tickets, IDs and a notebook should stay with you and never be forgotten at home or elsewhere. To avoid getting it wet, I put ours in a zip lock bag too. I bring a notebook to note the daily expenses to keep track of our spending. Collect all the IDs with you prior to leaving the house for a smooth check-in for your flight and to avoid scrambling and searching your bag while in queue. Communication - make sure communication lines are open between you, your spouse, your nanny, and your children. To avoid getting lost when out in a market or an unfamilar place, set a meeting place and time should you be separated. Never EVER leave children behind, alone, or unguided. Floor Mats - Request extra floor mats to immediately dry your hotel room's wet floor coming from swimming or bathing in the rest room. This will avoid slipping and head injury. Footwear - Choose a rubber-soled or non-slip footwear to bring with you to ensure tight floor-grip even when floor is wet. Documents - Scan and photocopy all your IDs and plane tickets should it get lost, you still have an extra copy. Child Safety - NEVER EVER LEAVE your children alone. Activities - Yes it could be fun, but make sure are safe or follow safety standards. Attracting Thieves - Avoid wearing jewels or carrying very expensive gadgets with you when on the streets or when walking around unfamiliar areas. You might be attracting snatchers and you don't want that to happen to you. Police Stations/Hospitals - Always take note of the nearest police station and hospitals and their contact numbers in the place you are travelling to just in case of emergency. These are just basic travel tips. You could always add what you think is necessary for you and your family. For a safe travel, as a general rule, communicating with your family, especially your children, the ground rules and the to-do's in case something happens, before leaving home, is the key. when vacationing with kids, parang dala talaga natin ang buong bahay no? honestly, nung wala pa si neo, we can travel light (as in backpack lang) and we're okay. now that we have him, sus, parang buong bahay dala namin. Sure no problem Istin! :) Glad to be of help! :) kakaloka is an understatement hahaha! Hi Louise! Thank you for these tips! Our familia will go on our first ever out-of-the-country trip this October and I'm more nervous than excited because this will be the first time we won't have a nanny with us! So good luck sa akin, sa likot at bigat ng anak ko! Wow! Happy trip to your family! Don't forget to enjoy and treasure the memories! Picture pictures okay? I'm glad to be of help with these simple tips. Last Fleur's blogversary,yup I was there sis!